10% of Net Sales For ALL Store Sales! Ink Raiser ink & toner fundraising program is an awesome program for any sized group and has no risk for your organization. Please take a moment to read the details of the program or call our office to speak with a customer services representative about the program. Every member of every organization has a personal, family or friend that has a connection to a business. Every business buys and consumes some kind of ink or toner product, why not help them save money and earn money for your organization. We provide your School or Organization with a personal and customizable Free Partner Ink & Toner e-commerce Web-Store. As a participant in our exclusive Ink Raiser Program, we will design and maintain a TURN KEY, fully stocked ink & toner e-commerce web store with thousands of earth friendly products at better prices than the national retailers offer. The web-store we setup for your school or organization will be branded with your approved logo, colors and other branding elements. Your web- store will be ready to RAISE MONEY for the school or organization within a few minutes from completing the online registration form. Every sale through your exclusive web-store earns you substantial income to support needed activities and causes. Your Partner Web-Store is completely FREE and will never cost you a penny to maintain. 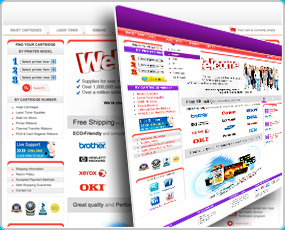 Furthermore, our helpful staff will assist with marketing your web-store effectively. Keep in mind, the more extensive your commitment to internally promoting your ink and toner web-store, the more success will be realized in reaching your fundraising goal. The average family spends $150 to $300 per year on these products and the average business spends $1,700 - $3,200 per year. Think of all of the people in your organization and their relationships to neighbors and friends. Not to mention, most people work in or at some kind of business. Why shouldn’t anyone who supports your program purchase from a socially responsible web-store like yours? We offer more income potential than other e-commerce fundraising programs. Other e-commerce affiliate shopping sites pay an average of 3% to 5% of gross sales by using a “Cookie System” to track your sales. Once the “cookie” expires and no longer tracks the customer you may never be credited with the sale. InkRaiser.com pays a full 10% on all WEB-STORE SALES. InkRaiser.Com pays its partner stores every month and provides exclusive backend login access so you can monitor all of your store sales activity. You can see how your fundraising continues to grow. You don’t have to worry about cookie expirations because all site data is available to you as a partner. We want to be your primary long term fundraising partner. RECEIVE additional donation at check out with our “Round Up” and “ADD-A-Buck” Feature. Imagine having every person that comes to your new ink & toner store to purchase products, having the opportunity to make an EXTRA DIRECT DONATION to your organization with no extra effort by you. Your new InkRaiser.com partner stores underlying State-of-the-art software offers two awesome features to make this extra revenue possible. The first feature in your new store is called the “ROUND-UP” feature and this feature will ask EVERY shopper at the time of check out if they would like to make a direct donation to your organization in the amount of the money needed to round the order price up to the nearest dollar. The second way your new InkRaiser.com partner store helps you earn an extra direct donation at the time of the sales, is with our “Add-A-Buck” feature. This feature asks the EVERY shopper at the time of check out, if they would like to ADD A BUCK ($1.00, $2.00, $ 5.00, or $10.00) to the purchase price as a direct donation to your organization. Your new InkRaiser.com partner store will be working every day to drive revenue to your organization. Did you know that most of the e-commerce fundraising sites on the internet do not actually process the transaction and that most. if not all of the e-commerce sites do nothing more than send your shoppers to other companies web sites for a referral fee which they share with you. Every person that shops at your InkRaiser.com partner store, stays on the your InkRaiser.com partner store during the entire transaction, giving InkRaiser.com partner stores the ability control the entire sales and transaction process and ultimately driving more money to your organization. When better to ask for additional contributions but when the credit card is out of the wallet? You receive the “Round Up” contributions under a separate account so that the sales revenue and added donations are clear and legible. Your Ink Raiser Partner Web-Store will continually bring customers back for more products because ink and toner are consumable and when depleted you need more. Therefore, your customers continue to support your cause. We stock high quality products that consumers want to buy. A growing number of shoppers care about where products come from these days and who manufactures them. We offer a large selection of ink and toner products within the web-store catalog that are made by socially responsible American manufacturers. We call them our “Earth Friendly” consumable products because they not only save consumers money but they reuse many of the components from previously sold ink and toner cartridges, but did you know that a toner cartridge shell could take 800 years or more to decompose in local landfills? We talk about being “Green”; why not start by setting up an Ink Raiser partner Web-Store today? Great prices on ink, toner and printer supplies in your personalized partner Web-Store. Our proprietary state-of-the-art software manages every aspect of your new personalized ink and toner partner Web-Store. We get the best available product to your customers in the fastest manner possible and at the lowest possible cost. We ship products from 11 strategically located warehouses around the country, so that most orders are processed and received within a few days. Ink Raiser fundraising program provides organizations like yours, the opportunity to help people anywhere in the United States. Their family members and friends save a legitimate 30% to 40% on ink, toner and related printer accessories as offered by nationwide retailers while giving your organization a substantial monthly contribution of 10% for every dollar spent in your personalized partner web-store. There is no need to deliver candy bars, wrapping paper, oranges or cookies. No need to wash cars or stand in front of Malls and Supermarkets asking for donations, simply direct your supporters and community businesses to buy their printer supplies where the price is right and it does the most good. No additional staff or volunteers needed to run your new Ink Raiser-Fundraising Program. We design, build and personalize your new ink and toner Partner Web-Store at NO EXPENSE TO YOU. We supply and manage the product inventory for your partner web store, again at NO EXPENSE TO YOU. We handle the shipping and customer service for you at OUR EXPENSE. We DON’T CHARGE FOR THE E-MARKETING EXPERTISE and your state-of-the-art WEBSITE that is provided your organization. We only ask that you aggressively and continually promote your Ink Raiser personalized partner Web-Store within your community and support groups. If you lose interest so will they. If you build a successful following of customers you’ll have long term rewards with this program and longtime residuals. Some schools and organizations jump from fundraiser programs each year seeking overnight success. We can assure you that your Ink Raiser Partner Web-Store program will provide you with immediate and long term success if you put in the effort and support required to spread the word throughout the community. Access the information you need about your Partner Web-Store. Your new partner web-store gives you back end log in access 24 hour / 7 days a week. This back end access will provide you with sales data and other pertinent web- store information. Your administrative control panel will allow you to access your partner store information from any computer that has access to the World Wide Web. You will have access to real time sales and income information on your organization’s and be in total control of your information. Don’t be kept in the dark by other on-line fundraising programs that promise one thing and deliver something entirely different. Quality consumable products which will exceed your customer’s expectations. Our goal is to grow your ink and toner e-commerce program every month, of every year. The only way to accomplish this is to offer really Great Products at Great Prices and deliver them in a few days. As your partner we are committed to doing exactly that. We offer a 100% satisfaction guarantee. Our Partner Store program will make you proud by delivering high quality products quickly. Remember we made a commitment to be your partner in a successful fundraising venture. We can assist you (if you want) to promote you new ink and toner partner web-store to your members, families, friends, neighbors and to local businesses in your community. We have the experience to guide you through these effective promotion programs. E-MAIL PROGRAM - As a part of our partner store program we offer FREE e-marketing; you find the email addresses and we will create a custom email list that can be used to contact potential customers and supporters of your school or organization. Marketing is a constant activity and your customers need to be reminded where to buy their products and help spread the word to their friends and family members. The frequency of contact will be determined by you. ANNOUNCEMENT LETTERS TEMPLATES As a new partner store with INK RAISER our staff will be working with you to help get the word out through press releases and public announcements. We will be with you at all times because your success is also our success. We believe that purchasing ink and toner from an Ink Raiser Partner Store site is a “social benefit” for all involved. We can provide press release templates should you require them. You can simply fill in the blanks with your school’s or organization’s information and e-mail or snail mail to the local media sources in your area. ANNOUNCEMENT LETTERS TEMPLATES are a great way to get started. – The partner schools and organizations can generate immediate sales by sending out or hand delivering “Announcement Letters” to local businesses. Every business buys ink, toner and printer supplies, why not purchase them from you? We are committed to helping our Partner Store Owners be Successful!